KIEV, Ukraine -- Ukraine’s energy sector mirrors the country’s pursuit of a multi-vector foreign policy. Kiev believes it can extract benefits from East and West without giving up its national sovereignty. Since 2010, President Viktor Yanukovych has taken concrete steps toward achieving energy security for Ukraine that his three predecessors merely talked about. The strategy has focused on expanding domestic gas production (Ukraine was the Soviet Union’s leading gas producer until the early 1970s), launching shale gas production and importing liquefied natural gas (LNG). Expanding gas production is on track and Chairman of Shell in Ukraine Graham Tiley and Prime Minister Nikolai Azarov have estimated that Ukraine will be self-sufficient in gas within 10–15 years. Tiley told the Ukrainian edition of Forbes magazine (September 6, 2012) that a three-fold increase in gas production from the current 20 billion cubic meters (bcm) is entirely feasible. The government’s Energy Strategy of Ukraine outlines a goal of domestically producing 47 bcm of gas by 2030. Besides big Western gas companies, the Yanukovych administration is also inviting medium-sized North American companies, such as Toronto-Houston-based Cub Energy, which is successfully exploiting gas fields in eastern Ukraine and the Carpathian region. Ukraine’s gas sector, run down since the 1970s when Soviet investment shifted to Western Siberia, desperately needs the technology and capital that large- (Shell) and medium-sized companies (Cub Energy) can bring to Ukraine. Ukraine is estimated to have the third largest shale gas deposits in Europe and production has been endorsed by local councils in Eastern Ukraine, which the Party of Regions control, while facing opposition in Western Ukraine from the nationalist Svoboda party. Svoboda’s stance is at odds with its anti-Russian rhetoric as shale gas would assist in Ukraine’s energy independence from Moscow and has more to do with the banal use of shale to attack the authorities. Political opposition purely on environmental grounds raises suspicions as Ukraine’s green movement has been dormant since the early 1990s. LNG has run into more difficulties after an imposter, supposedly authorized to speak for the Spanish company Gas Natural, turned up to sign an agreement with Ukraine in late 2012. Ukraine’s LNG imports are also reliant on securing supplies from countries such as Azerbaijan, which may not be forthcoming, and the willingness of Turkey to permit LNG to be transported through the already-crowded Bosphorus Straits. Oil production in Ukraine is also set to expand after the Vanco contract was successfully defended in the Arbitration Institute of the Stockholm Chamber of Commerce. In October 2007, the Yanukovych government signed a production sharing agreement (PSA) with Vanco International (registered in the Bermuda Islands and a subsidiary of the Houston-based Vanco Energy Company), which assigned all rights and obligations on the PSA to Vanco Prykerchenska (registered in the British Virgin Islands). In June 2008, the Yulia Tymoshenko government annulled the Vanco contract because it was registered offshore and included non-transparent owners. Opening the market back up to Vanco is part of a policy of bringing in new players to Ukraine’s energy sector outside of the traditional Western Ukrainian–dominated gas lobby led by Dmytro Firtash and reversing two Tymoshenko government decisions in 2008–2009 against Vanco and RosUkrEnergo (RUE). Firtash has replaced the natural gas intermediary RUE with Ostchem. In addition to Vanco’s renewed oil activities, “The Family” — the political and business faction of Ukrainian elite connected to Yanukovych — is developing new interests in gas through GasUkraina-2009 and shale. In 2010 Yanukovych gave Russia all of the concessions then-Russian President Dmitry Medvedev demanded in his August 2009 open letter to President Viktor Yushchenko; but this failed to extract price concessions from the 2009 Russian-Ukrainian gas contract. If then–Prime Minister Vladimir Putin had been more forthcoming, the Yanukovych administration would not have sought energy independence — just as former Ukrainian President Leonid Kuchma may not have sought support from the United States or the North Atlantic Treaty Organization to overcome Russian pressure. In 2012, Ukraine paid $432 per 1,000 cubic meters, or 40 percent more than what Italy pays and 20 percent more than Germany. Consequently, Prime Minister Azarov complained that Russia is “strangling” Ukraine with high gas prices. Moreover, Ukraine receives two times lower fees for transit of Russian gas than Slovakia and Hungary. The ludicrous nature of Ukrainian-Russian relations is illustrated by the fact that Ukraine imports cheaper Russian gas from Germany and Slovakia rather than directly from Russia. High gas prices, low economic growth, poor financial conditions and the upcoming 2015 presidential elections have led to a paradigm shift toward privatizing and leasing what were considered Ukraine’s “crown jewels” — its gas pipelines. A February 2007 Tymoshenko-initiated law banning the lease, rent or sale of the pipelines was voted through by 430 (out of 450) deputies — including the Party of Regions when Yanukovych was Prime Minister. On April 26, however, the government proposed draft legislation on the privatization of the state gas company Naftohaz Ukrainy that would break it into separate companies and privatize the pipelines. First Deputy Prime Minister Serhiy Arbuzov, affiliated with the “Family,” said he expected parliament to quickly vote on the law. Moreover, the proposed law would create a Russian-Ukrainian gas consortium that precludes the European Union, which Russia has always opposed including. The draft law has attracted opposition accusations of “treason” and will likely lead to a stormy parliament and greater tension in 2015. 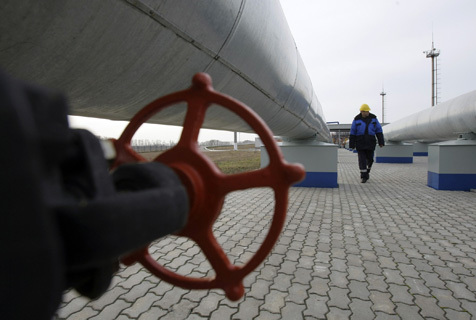 Yanukovych receives three benefits from the lease of Ukraine’s gas pipelines. Firstly, in exchange for leasing the pipelines, Russia would lower the price of gas sold to Ukraine to $250 per 1,000 cubic meters, saving the latter over $6 billion annually. Secondly, it is preferable to an International Monetary Fund (IMF) agreement with strings attached, such as increasing household utility prices, which would be unpopular ahead of Yanukovych’s re-election bid in 2015. Thirdly, Yanukovych would be able to demand Putin’s political support in 2015, arguing that the Ukrainian opposition promised to annul the 2010 Black Sea Fleet base agreement and 2013 gas pipeline lease if they returned to power. Much like President Kuchma’s alignment with the US and NATO in the 1990s, Ukraine’s energy security push was sparked by aggressive Kremlin policies; but continuing financial problems and Yanukovych’s political considerations compelled the government to open Ukraine’s gas pipeline system to lease agreements with Russia. Putin, on the other hand, undoubtedly views the lease of Ukraine’s pipelines as a stepping stone to their outright purchase, in line with Russia’s goal of undermining Ukrainian sovereignty. The “multi-vectorism” in Kiev’s energy policy will, therefore, require a careful balancing act and formidable foresight to ensure that it does not eventually result in Ukraine’s subjugation to Russia’s sphere of influence.